AgroAtlas - Crops - Helianthus annuus L. subsp. annuus var. annuus f. annuus ornamentalis (Wenzl.) Anashcz. - Common sunflower. Helianthus annuus L. subsp. annuus var. annuus f. annuus ornamentalis (Wenzl.) Anashcz. - Common sunflower. Family: Asteraceae Dumort., genus: Helianthus L., Helianthus annuus L. - Cherepanov S.K., 1995. Intraspecific classification by A.V. Anashchenko (1979) includes three subspecies: H. annuus L. subsp. annuus, H. annuus L. subsp. lenticularis (Dougl.) Ckll., H. annuus L. subsp. petiolaris (Nutt.) Anashcz. 2n=34. Sunflower is an annual plant. Its height varies from 60 cm (with short-stalked sunflower varieties) to 5 to 6 m (with silage varieties). Sunflower has a tap root system over 1 m long. Therefore, sunflower is a drought- and wind-resistant plant. It has an upright herbaceous stalk, which lignifies by the end of the vegetation period. Stalk diameter in its thickest part is 5 to 7 cm. Three kinds of sunflower stalk ramification are distinguished: upper, lower and along the whole stalk. The lower bow-shaped ramification looks very impressive. Two powerful branches branch off from the first couple of true leaves on opposite sides of the stalk. Thus, the plant is trident-shaped with one main shoot and two lateral shoots. Ramification along the whole stalk is observed when a branch is formed in each or almost each axil. The upper ramification begins from the upper third or half of the stalk. The ramification provides a practical reference, since most varieties used as paternal varieties in heterosis sunflower breeding are ramified. They form numerous inflorescences, have a longer blossoming period and produce more pollen, which allows breeders to obtain hybrids from maternal plants with cytoplasmic male sterility. Industrial hybrids yield more and are easier to cultivate and harvest when they have a single stalk with one inflorescence. Therefore, the varieties whose ramification is of the recessive inheritance type are chosen as paternal forms. Sunflower inflorescence (anthodium) is large, more rarely small, frequently with a flat thalamus, more rarely with a convex or concave thalamus. Sunflower anthodium is multiflorous; it may be inclined or upright. Each inflorescence has 200 to 1000 flowers. Marginal flowers with pseudolingulate florets are sterile and barren yet attract insects. Inner flowers have tubular florets. They are bisexual. Each one has 5 stamens, which are concrescent on top, with anthers that form a tube with a long pistil inside; the pistil has a two-part stigma. The flowers with pseudolingulate florets range in color from yellow to orange, dark orange, yellowish straw-colored, straw-colored, or straw-colored with a tinge of anthocyan. The tubular florets of double-flower sunflower varieties tend to assume the lingulate shape to form a double inflorescence that resembles a chrysanthemum (e.g. in the Kubansky makhrovy ornamental variety). The size of the inflorescence varies greatly depending on cultivation conditions and genetic features of particular cultivars. Larger anthodia are 20 to 25 cm or greater in diameter. Flowering within each inflorescence is acropetal. It drags out for 7 to 15 days. The protandry is well pronounced. Flowers with tubular florets begin to blossom early in the morning (5 to 6 o'clock). The concrescent anthers take about two hours to move out. Then they open up, and the pollen spills out. Anthers may be of different color (from light grey to black and dark violet). The pollen is yellow in color. Sunflower's typical feature is its heliotropism. The open inflorescences which face the sun follow its movement (it is a particular case of phototropism). Sunflower has opposite leaves that alternate in the upper part of the stalk. They are large, simple, petiolar, cordate with an acuminate tip. Leaf blades are usually green in color, rarely light green. The color intensity depends on the presence of waxy film or down and on the shape of the leaf blade surface. Sunflower fruit is an achene consisting of a coat and nucleus. Most varieties have an achene which is black or black-and-white striped in color. Sometimes sunflower achene is white, rarely grey, dark violet, auburn or beige. 1000 sunflower seeds weigh 40 to 125 g.
Sunflower is a heat-loving plant. Young sprouts survive short nights and morning frosts. Sunflower is very fastidious about light. It needs more watering than usual before blossoming and during ripening. The vegetation period lasts 80 to 140 days. One sunflower leaf takes an average of about three days to form and unfold. Most artificially bred varieties have 35 leaves. Therefore, their vegetation period lasts 105 days. Sunflower leaves have different functions in different tiers. Leaves in tiers 12 to 15 and 23 to 25 have the greatest photosynthetic activity, the most intensive assimilator drain and the lowest water content. They are critical for fat biosynthesis in sunflower seeds. Sunflower plants have redundant vegetative growth. Harvested achenes comprise no more than 25% of sunflower.s above-ground biomass. Sunflower plants with optimal stomatal regulation - a light-reflecting, silvery down on their leaves and a thicker, waxy film on their cuticle - consume moisture for seed formation during flowering and ripening most effectively if their lower leaves quickly die off during droughts and the surface of their leaves increases moderately during the first half of vegetation, even under favorable conditions. Sunflowers are cross-pollinating, entomophilous plants. They are pollinated mostly by bees, bumblebees and other insects. Pollination by wind also takes place, even though sunflower pollen grains are relatively big and easily stick together. Cross-pollination is promoted by the fact that sunflower stamens and pistils (proterandries) mature at different times, by the location of the anthers, by the pistil's stigma placement (the pistil is located higher, which hinders self-fertilization), and by the genetically controlled system of self-incompatibility, which suppresses the growth of pollen tubes of pollen grains of the same plant in the style and the gynaecium of the pistil. However, various research reports that variations, ranging from full sterility to active seed production, have been observed following self-fertilization of sunflower plants in different populations. Sunflowers thrive on black earth. Best sunflower precursors include fallow wheat, maize and other plants that do not consume moisture from deep soil. Cultivated sunflowers are grown in the steppe. Their ability to form adventitious roots from their hypocotyls allows them to survive droughts in the steppe and to resist steppe winds. Sunflower is a short-day plant. However, as E.N. Sinskaya points out, older sunflower varieties (snack food varieties) are long-day plants. Wild sunflower was introduced to Europe in 1510 by the Spanish. At first, it was cultivated as an ornamental plant. Sunflower was first described by Lobel in 1576 as "a flower of the sun". The cultivated sunflower is the outcome of a long breeding process. (The snack food varieties were bred first and then used to breed oleaginous varieties). In Russia, sunflower appeared in the 18th century when the specimens of sunflower were sent to Russia from the Netherlands at the behest of Peter I. For over 125 years, sunflower remained a vegetable garden and ornamental plant. Obtaining oil from sunflower was first mentioned in 1779 in the Proceedings of the Russian Academy of Sciences in .On Oil Production from Sunflower.. In 1829, D.S. Bochkaryov, a serf from the Alekseevka village of the Biryuchenskoye District of the Voronezh Province, first produced oil from sunflower. 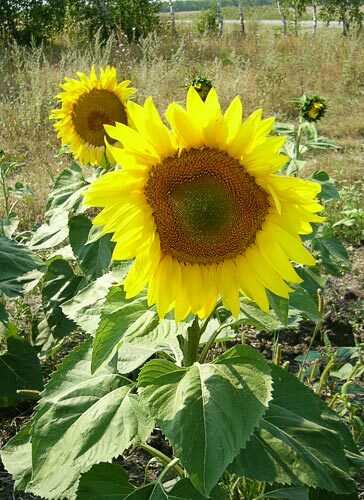 By the mid-19th century, sunflower cultivation had become widespread in many districts of the Voronezh and Saratov provinces. In the 19th century, cultivated oleaginous sunflower was introduced from Russia to the USA and Canada. Argentina, Romania, Turkey and other countries now have large sunflower plantations. In 1985, sunflower was sown in the USSR on 4.05 million hectares. On average, it yielded about 1,300 kg per hectare. Yield depends greatly on environmental conditions. In the last 30 years, the Peredovik sunflower variety sets yield standards in main Russian sunflower cultivation areas. It yields 2,200 to 4,000 kg per hectare. The best hybrids may potentially yield up to 4,600 kg per hectare. Diseases of sunflower plants are the main obstacle to high sunflower yields all over the world. In the Russian Federation, sunflower is mainly cultivated in Northern Caucasia, the Central Black Earth Belt, the Volga Region and such republics of the former Soviet Union as the Ukraine, Moldova and Kazakhstan. In 2004, 262 sunflower varieties and hybrids were approved for cultivation in certain areas of the Russian Federation. 35 of them are highly oleaginous (Azovsky, Belgorodsky 94, Bogucharets, Buzuluk, Veydelevsky, Voronezhsky 638, Yenisei, Kazachy, Leader, Stepnoy 81, Photon, etc.). The main breeding agencies include the All-Union V.S. Pustivoyt Research Institute for oil-yielding crops, the Armavir Experimental Station of All-Union Research Institute for oil-yielding crops, the Veydelev Research and Industry Agricultural Institute of the Central Black Earth Belt for sunflower breeding and seed-farming, the Don L.A. Zhdanov Experimental Station for oil-yielding crops, the Voronezh Experimental Station of All-Union Research Institute for oil-yielding crops, and the Tambov Research Institute for Agriculture. Sunflower is a valuable oleaginous and fodder crop. Sunflower achenes contain 38-68% oil ready for human consumption as food. Oil content is determined as the ratio of fat to non-fat substances in the achene. Most of the non-fat substances are proteins. Oil content decreases with a surplus of nitrogenous fertilizers in the soil and with wider growing spaces, since these favor nitrogen consumption by individual plants. Sunflower oil contains palmitic, stearic, oleic, linoleic, and linolenic acids. The two main fatty acids - oleic and linoleic - account for about 90% of all fatty acids. Sunflower oil with high oleic acid content resists oxidation longer than other sunflower oil. With high palmitic oil content, sunflower oil remains stable at low temperatures. The nutrient value of sunflower oil depends on the vitamins, natural oxidation-inhibiting agents and prooxydants therein rather than only on its fatty acid content. Sunflower seeds accumulate 0.7-1% phospholipids (phosphatides) and 0.23-0.24% sterols. The oil of modern sunflower varieties contains 60-80% tocopherols, whose specific features are related to their A-vitamin activity and anti-oxygenic action. As for the number of water-soluble vitamins (nicotinic acid, thiamine, biotin, and riboflavin), highly oleaginous sunflower seeds are similar to peanut seeds. Ripe seeds contain 0.12-0.16% pigments (carotinoids, carotins, and xanthophylls). Sunflower seeds are not only highly oleaginous but also accumulate a lot of proteins (up to 20-25%). Over the course of the breeding process of varieties with high oil contents, the protein composition of seeds has considerably changed; the number of water-soluble protein components (amino acids) has increased overall, which has in turn increased the percentage of some indispensable amino acids, including lysine, in the total protein content. The main components of the protein reserve in the achene are the 11S-globulin, called helianthinin, and the 2S-albumin. Sunflower oil is used in the food and soap industries and for the production of varnish and paint. Sunflower oilcakes and oilseed meal provide concentrated livestock fodder. Livestock is fed with thrashed sunflower anthodia and with the silage from sunflower plants harvested while they were blossoming. Sunflower is a good bee plant. Testaceous sunflower varieties are very important for sunflower breeding. These varieties feature a coal-black layer in the pericap between the hypodermal cell layer and the sclerenchymal tissue. This black layer consists of phytomelan, which does not dissolve in water or alkalis. This layer makes sunflower pericap harder and protects sunflower achene from the penetration of the mycelium of mold fungi. Testaceous sunflower varieties resist Homoeasoma nebulella very well; in fact, they prevented complete extinction of this cultivated plant. Sunflower pericap weight varies from 18-20 to 40-50% of the total achene weight. In modern sunflower cultivars, the pericap weight has been reduced to 20-25%, thus greatly increasing the oil-bearing capability of sunflower achenes. Good sunflower varieties should combine the ability to not shed achenes from ripe anthodia with easy yielding and threshing. Difficulties in threshing are often caused by bract length and by the presence or absence of a "horseshoe., where the achene is fixed to the thalamus. The oil and fat industry prefers those achenes which are round in sections, slightly flattened at their sides and slightly elongated lengthwise. Optimal pericap separation is also very important. Pericaps should mostly stay in place during mechanized harvesting and then fall off in husking machines during processing. Sunflowers are planted when soil temperatures reach 8-12 degrees C with wide-row or single-grain techniques (with 70-90 cm between rows). 20-50 thousand plants are planted per hectare on irrigated lands, sometimes even 60 thousand. The number of planted sunflowers should exceed the number of surviving plants per hectare by 20% (about 5 to 8 kg of seed). Planting depth is 6 to 8 cm. Sunflower harvesting begins when the bulk of anthodia (80-90%) turns brownish yellow and when seed humidity reaches 12-14%. Harvesting is pereformed by desiccation. Sunflowers are sown with maize-seeding machines. Sunflower plants are harvested with reaper-threshers (with accessories for sunflower harvesting). Anashchenko A.V. 1974. On Taxonomy of Genus Helianthus L., in: Botanical Journal. Vol. 59, No. 10. p. 1472-1481. Cherepanov S.K. 1995. Vascular Plants of Russia and Neighboring Countries. St. Petersburg. Gavrilova V.A., Anisimova I.N. 2003. Genetics of Cultured Plants. Sunflower. St. Petersburg. Sinskaya E.N. 1969. Historical Geography of Cultivated Flora. Leningrad. Vasilyev D.S. 1983. Sunflower Agrotechnics. Moscow.